The Saiwall SD-WAN platform platform includes a Web interface management console to control the LAN and WAN network from any company that has multiple branches and wants them to be interconnected, in an efficient, swift and safe manner. From the management interface, the client has an overview of its entire network and it ensures absolute efficiency, visualising, modifying and updating any network setting that may interest the client. Among others, the client can centrally manage: physical and remote VPNs, Proxy, Firewall, WiFi, load balancing of multiple lines with Failover and Backups, RIG Monitor, Wake on Lan, DHCP, network graphics, visualisation maps of the global network, real time alerts and others. The Saiwall SD-WAN platform can be installed physically, with SAIWALL hardware which is set up on the client’s central IT system and remotely, in branches, or virtualised in any environment that the client may have in their central IT system, in an external data centre or on the cloud. It can be integrated with any virtualisation system with software such as VMware, KVM or OpenStack, among others. Another strong point of the Saiwall SD-WAN is that it allows hybrid integration, meaning a physical system can be implemented with another virtualised system, thereby providing a backup of the entire system. 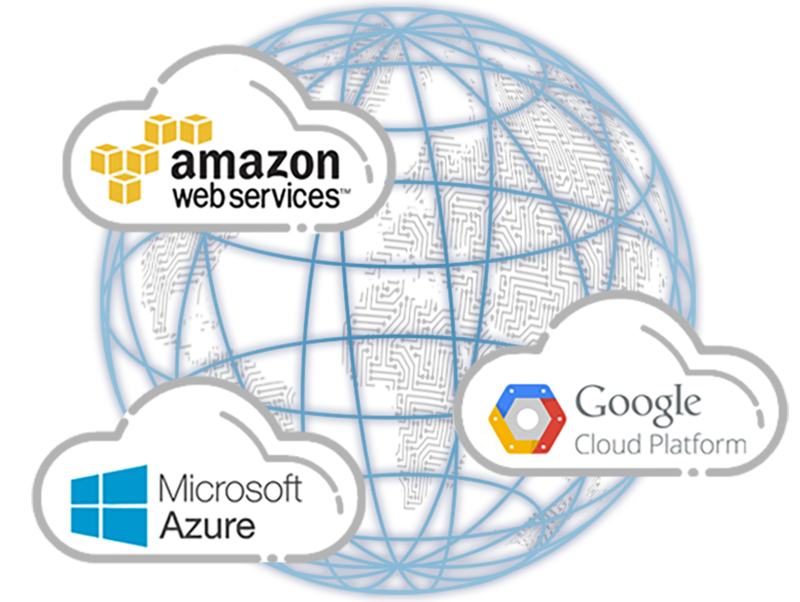 Saiwall SD-WAN can be integrated into any CLOUD environment the client wants, without any restrictions, integrating with AWS, AZURE and Google Cloud, among others. An increasing number of companies are making the jump to the CLOUD and committing to IT systems that are fully on the cloud. This is where Saiwall SDWAN can be the ideal tool to improve communications, redundancy, security and scalability, reducing costs considerably. Saiwall SD-WAN facilitates the management and optimisation of up to 9 lines from different FTTH, 4G, ADSL providers, etc. which can be balanced by each branch. Should one of the lines collapse, the Failover will act automaticallya. The SD-WAN technology allows its users to manage, according to different optimisation criteria, the use of the Internet lines that a company can have in each of its branches. This is essential when a company’s communications cannot collapse and a plan B and plan C are needed, such as Backup via 4G. Saiwall SD-WAN includes a Firewall Layer 5 that is used to configure all the LAN/WAN access policies of a company. These configurations can be centralised from the main control panel and sent to as many Saiwall SR devices in the branches as required. Saiwall SD-WAN includes Proxy LAYER 7 to be able to filter the web browsing by categories. What is interesting in this case is that the entire configuration is centralised, for the central IT system and remote branches alike. Another key point of the Saiwall SD-WAN Proxy is the configuration of Proxy rules, Integration with LDAP, the option of Virus Scanning, and the control of access points via an interface that saves LOGS. With Saiwall SD-WAN, all the companies that use the Windows Active Directory can integrate with the platform, both in physical remote branches (for any users who are behind this network) and for the remote users who are connected from anywhere in the world. 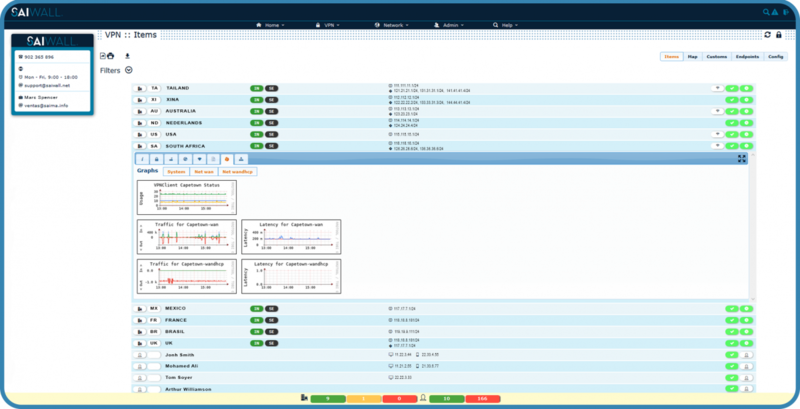 The Saiwall SD-WAN centralised control panel can be used to configure the WiFi connections of all the remote branches. In addition, different networks can be configured per branch and the connections, can be segmented. For example, a WiFi network for guests and a WiFi network for internal use in the company. WAN OPTIMIZATION, we have our own nodes so that, when necessary, the traffic of our international clients can be routed, and latency can be improved. At present, we have physical nodes in Europe, the United States, Asia and Central America; every month we increase the global interconnection nodes. In recent years, interconnectivity has taken a great leap, since Tier 1 cable operators have committed to implementing Fibre Peering on a global level, thereby improving the communication lines worldwide. We have seen the change from 10Mb asymmetric ADSL lines to 300 and 500 Mb symmetric FFTH lines, at a very affordable price. This has allowed all companies to work online from anywhere in the world, and with extremely low latency; it has led thousands of companies to commit to solutions such as Saiwall SD-WAN to improve their technological infrastructure and cut back on costs. Saiwall SD-WAN facilitates the centralised management of all the VPN connections of the branches of a company from the main control panel, using TAGS to configure the policies that permit the management of remote branches in groups, subgroups or individually. Any configuration required on the remote device can be performed on the central control panel and this will send it to the branch or branches requiring configuration. The Saiwall SD-WAN platform does not have a limit on the number of connections to remote branches: according to the number of connected branches and when the system requires it, the central application will be expanded, adjusting the power of the physical Saiwall machines or the virtualised machines where the service is installed. Saiwall SD-WAN facilitates the centralised management of all the VPN connections of the remote users of a company from the main control panel, using TAGS to configure the policies that permit the management of users anywhere in the world. Any configuration required in the connection of remote users can be done on the central control panel, and this will send it to the remote users when they reconnect remotely. The Saiwall SD-WAN platform does not have a limit on the number of connections by remote users: according to the number of connected users and when the system requires it, the central application will be expanded, adjusting the power of the physical Saiwall devices or the virtualised machines where the service is installed. Saiwall SD-WAN integrates with any line with Internet connection, such as for example ADSL, SDSL, FTTH, HDSL, Point-to-Point, 3G, 4G, etc. Therefore, different types of connections can be set up for each branch and load balancing, failover and backup can be performed. This ensures continuity in the connection service, since if the connection of one of the lines were to collapse, all the WAN traffic would automatically go to the other lines connected in Failover or Backup mode. Saiwall SD-WAN can be installed as a local cluster or remote cluster, thereby allowing companies to back up their main infrastructures and copy their DDBB and applications in a simple and fully scalable way. Today, the majority of companies want their data to be replicated in different remote locations to ensure a continuity in the service. In the event of an incident, the Saiwall SD-WAN service automatically guarantees this continuity in an ACTIVE-ACTIVE or ACTIVE-ACTIVE-PASSIVE way. SAIWALL SD-WAN platform virtualised on the CLOUD. SAIWALL SD-WAN platform virtualised in the client’s house. SAIWALL SD-WAN platform virtualised in remote data centre, where the client is hosted. SAIWALL SD-WAN platform in the client’s house. SAIWALL SD-WAN platform in remote data centre, where the client is hosted. 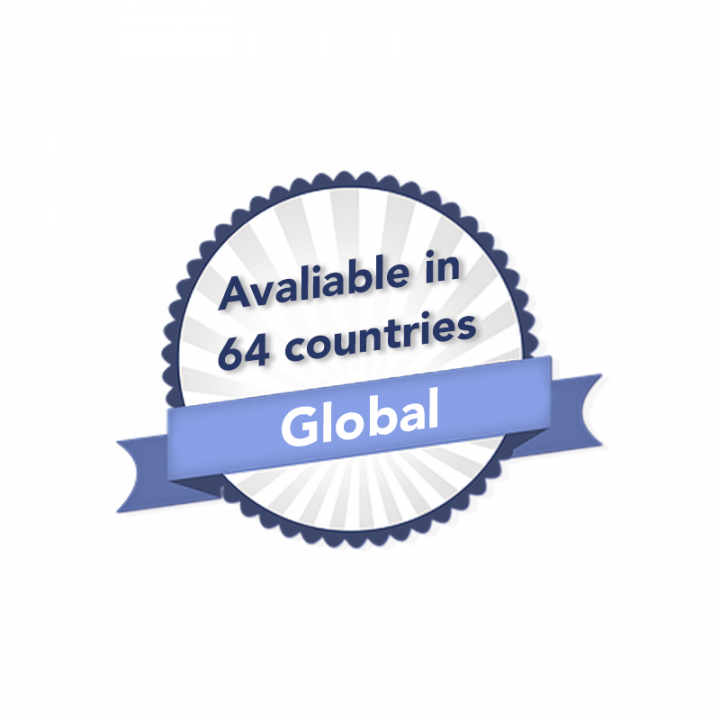 At we have experts in Wan network consulting, to help our clients to back up and secure their global infrastructure to ensure their communications service. One of the strong points of SD-WAN technologies is that the communication costs can be reduced greatly compared to the conventional solutions in place to date, such as for example MPLS lines or Point-to-Point lines which have very high maintenance costs, because they require line management and complex configurations by the service providers. With SD-WAN it is different. With this technology, the client has all the KNOW HOW to control their WAN network, in addition to not having to depend on one single provider. Instead, they can seek out the best Internet line providers with the best maintenance costs in each country where they have branches. Today, with all the developments and improvements in the capacity of Internet lines worldwide, with extremely high interconnection speeds and very low latency, it is the ideal solution to unite all the branches of a global company. Another key feature of the Saiwall SD-WAN services is the ease with which it can be integrated with any communications environment and with any line type. This allows clients to set up their global network very swiftly. The equipos SAIWALL SR, which are installed in the remote branches, are configured with the required information so that when a connection is made in the remote branch, between the Internet provider’s router and the Switch of the internal network, these, via DHCP, can connect to the LAN/WAN NETWORK and, via the Internet, establish a fully secure VPN for the company’s central IT system. The time required for this action to occur is less than 2 minutes, from when the SAIWALL SR device connects to the Internet and the VPN connection is securely established, since we use AES 256 bits encryption. Once the connection with the device has been established, we will have remote access and we can perform all the relevant configurations. A team of highly qualified SAIWALL SD-WAN support technicians is available to all our clients, working 24/7 to provide support to any client requiring the SLA service. We include different levels of support which allow all our clients to contract the service that most interests them.